Microsoft Surface RT might be the most popular gizmo with Redmond's fledgling OS for ARM-based processors, but the Lenovo IdeaPad Yoga 11 might as well be the most interesting. The 360-flippable hybrid device solves the "laptop or a tablet" dilemma in an elegant and unorthodox way, allowing you to flip the 11.6" HD screen half all the way back on its reinforced hinges, until it touches the keyboard half back, and becomes a tablet. The keyboard gets turned off automatically after you pass the 180 degrees movement, and you can also set it up in a "tent" position for watching movies, for instance. 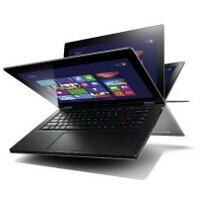 Lenovo put the Yoga 11 up for order on its website on the hush-hush, with shipping times listed at up to four weeks. The 32 GB version costs $679.2, and the 64 GB one is $759.2, with the coupon code CyberMonday. A quad-core Tegra 3 processor is humming inside, and the convertible device sports up to 13 hours of battery life.